Coffee is intertwined with culture and economy in Ethiopia. Next time you order your favorite coffee blend from Starbucks consider the fact you may be drinking Ethiopian coffee. Starbucks serves three varieties of Ethiopian coffee, Sidamo, Yirgacheffe and Harrar. Africa is the second largest of the earth's continents after Asia. Africa comprises almost ¼ of the world's total land mass. One country in Africa in particular is Ethiopia which is slightly less than twice the size of Texas and Ethiopia's Sidamo province is the birth place of coffee. Legend has it that Kaldi, a goat herder who lived in Ethiopia, accidentally discovered coffee. One day, Kaldi observed his herd of goats chewing on red cherries from a tree he had never noticed before, after which they became energized. After trying them himself, Kaldi brought the cherries to a local monastery, where the monks tossed them in the fire as they disapproved of the idea of using the strange fruit. Instead of burning the beans, it actually roasted them. Those roasted beans were used to create the first coffee. Depending on the time of year you can also find Ethiopian whole coffee beans at your local grocery store. Kenya also produces fantastic coffees. Coffee in Ethiopia is dealt with respect in regards to serving ceremonies which are a daily essential element in Ethiopian life. Coffee is Ethiopia's principal source of income and the worlds demand for quality coffee is increasing steadily. In Ethiopia, coffee can still be found growing wild in the forests. Coffee in Amharic, the national language of Ethiopia, is Buna. Buna is also the name of the coffee ceremony conducted by Ethiopian women. The host clothing should be a traditional Ethiopian dresses when preparing the ceremony. When a man prepares Buna he is questioned regarding his masculinity however there are a few exceptions to this rule. 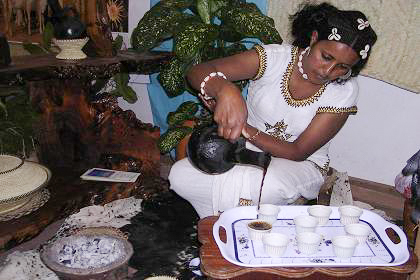 The Ethiopian coffee ceremony is a ritual that the women of Ethiopia have participated in for centuries. The coffee may be prepared three times in one day for various reasons including a meal. Once the beans are roasted, they are ground. There are three rounds of boiling and drinking coffee in the Ethiopian coffee ceremony. Popcorn is the snack or maybe bread, since the Buna is never just coffee. Coffee is Ethiopia's main source of income and the worlds demand for quality coffee is increasing steadily. More than 15 million people grow the crop for a living and hundreds of thousands of middlemen are involved in the collection of the crop from farmers and supply to the export and domestic market. A sizable amount of foreign exchange, accounting up to 30% of the total yearly export income is derived from coffee. 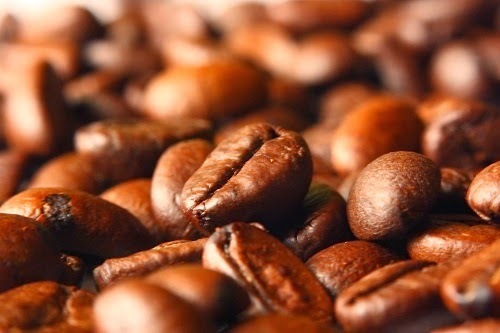 Ethiopia is the world’s fifth largest coffee producer and Africa’s top producer. The wild fluctuation of the coffee market led to an intergovernmental initiative to attempt to stabilize the coffee market and to halt the fall in prices. Out of these efforts the International Coffee Agreement was created in 1963. Africa accounts for more than half of the International Coffee Organization (ICO) member producing countries and has a long tradition of consultation through its continental organization the Inter-African Coffee Association.